Libya's Abu Attifel oil field, which had been shut for about two weeks due to a stand-off at eastern export terminals, has resumed operations, sources said. The International Energy Agency says spare capacity among oil producers "could be stretched to the limit" as OPEC aims to pump more. U.S.-China trade tensions continue to fuel concern about falling demand for crude oil. 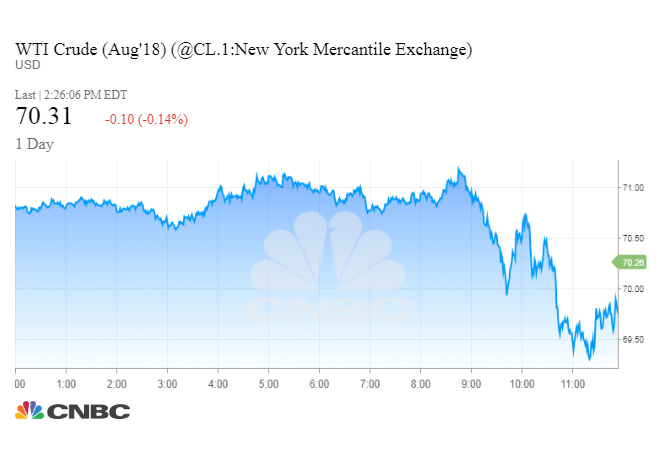 U.S. crude steadied above $70 a barrel after earlier extending Wednesday's sharp losses as Libya said it would resume oil exports and the market continued to monitor U.S.-China trade tensions. The announcement that Libya's National Oil Corp (NOC) would reopen four oil export terminals, ending a standoff that had shut down most of Libya's oil output, was a key catalyst for a dramatic sell-off on Wednesday, analysts said. The reopening will allow the return of up to 850,000 bpd of high-quality crude to international markets. Two Libyan oilfields will reopen, NOC and industry sources said on Thursday, easing supply concerns that have boosted the market. U.S. light crude ended Thursday's session down 5 cents at $70.33 a barrel, after touching a session high of $71.24 and a low of $69.23. The contract fell 5 percent the previous session. Benchmark Brent crude oil was up 83 cents, or 1.1 percent, at $74.23 a barrel by 2:22 p.m. ET. On Wednesday, Brent slumped $5.46, or 6.9 percent. Focusing on bearish factors, the market shrugged off warnings from the IEA that there is potentially a spare capacity crunch. "Rising production from Middle East Gulf countries and Russia, welcome though it is, comes at the expense of the world's spare capacity cushion, which might be stretched to the limit," the Paris-based agency said in its monthly report. "This vulnerability currently underpins oil prices and seems likely to continue doing so," the IEA added. Early in the session, crude futures pushed briefly higher after U.S. President Donald Trump's comments that his administration would try to negotiate a fair trade deal with China. "The market was still nervous," said Phil Flynn, an analyst at Price Futures group in Chicago. After U.S. crude briefly traded above $71 a barrel, traders exited positions, leading the market lower to test below $70 a barrel, he said. The market also brushed off bullish data from information provider Genscape, which reported that inventories at the Cushing, Oklahoma delivery hub had fallen 929,399 bpd from July 6 to July 10, traders said. In the previous week, U.S. crude inventories fell by nearly 13 million barrels last week, the most in nearly two years, reducing overall crude stocks to their lowest point since February 2015. The decline in U.S. inventories was partially due to a fall in stocks at the Cushing, which dropped 2.1 million barrels. Supply to the U.S. market, particularly Cushing, has also been squeezed by the loss of some Canadian oil production. "For WTI (U.S. light crude) there is tightness at Cushing, which will be supportive over July and August," said Virendra Chauhan, oil analyst at Energy Aspects in Singapore.